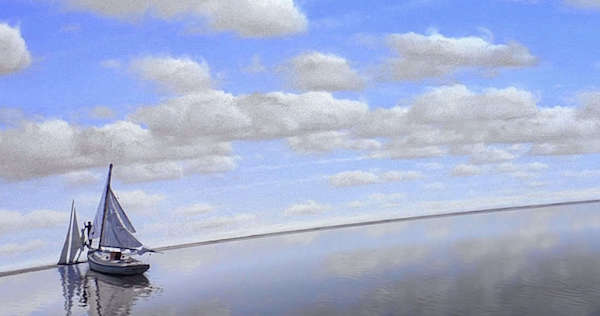 The climactic scene in The Truman Show is so intensely satisfying that it still stuns me after all these years. One musical technique plays a big part in that. Non-harmonic tones are notes that are not part of the chord of the moment but still make sense because they follow certain patterns. The non-harmonic tone that makes the climax of The Truman Show so devastatingly perfect is a pedal point (or simply ‘pedal’). The rule for a pedal is simple: A note starts out as part of a chord, then it doggedly hangs on, even as the chords change around it. You’re still hearing that same note, maybe held out long, maybe pulsing in quarters or eighths. Sometimes it’ll belong to the chord and sometimes not, but regardless, it keeps sounding. That’s a pedal. Sometimes it’s just a nice effect. But a pedal point can also serve the emotional purpose of establishing reality, for better or worse — a steady insistence that we accept the situation. There was a feeling of unreality when the news of Diana’s death first broke. It seemed somehow impossible. Tavener’s pedal had the effect of cementing our acceptance: Oh my God, she really is dead. We spent the film watching Truman struggle with uncertainty and confusion, wanting answers. When his hand touches the wall, he finally has his answer — and the pedal, the music of finality, tells us it’s true.